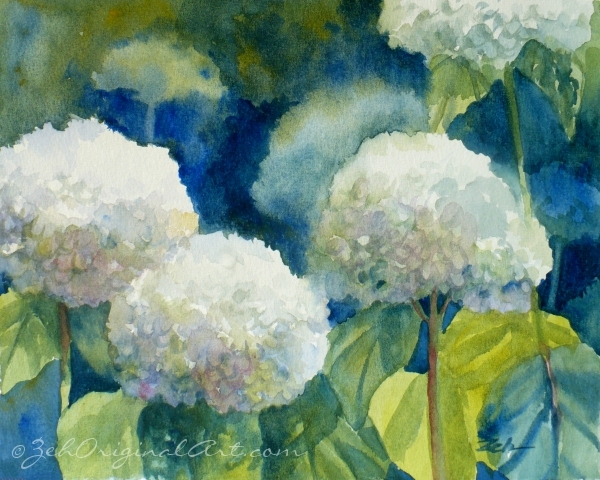 It was another lovely day to paint outdoors and I remembered that those puffy white hydrangeas were just waiting for me to paint them. So I quickly grabbed a couple of brushes, an 8"x10" sheet of watercolor paper, a small piece of foamcore board to back the paper, my paints, jar of water, small table and a folding chair and went out to the flower garden. I did not even take the time, as I normally do, to tape the watercolor paper to the board, nor did I bring a pencil to sketch the scene first, but dove right in with watercolor. There is something magical each time a painting develops on a blank sheet of paper or canvas especially with watercolor because of the unpredictable way the colors run together. When you begin with only a vague idea of what the finished painting will be, the wonder increases with each brushstroke. I hope you enjoy the fresh, spontaneous quality of this painting. The original is sold, but you can contact me if you would like to order a print or a hydrangeas painting done just for you.Thanks for stopping by! Such a beautiful lush painting. You really captured the softness while still achieving that deep blue. Lovely. I. LOVE. THIS. PAINTING!! YOU are very talented! !